EDUCA, the Annual Congress for Teacher Professional Development, has continuously emphasized the importance of teacher education for more than 10 years. For us, ‘teacher’ is a giver, leader, and a change agent who could strengthen the future of the nation. However, according to several international educational research studies, the value of teacher is decreasing. For instance, OECD 2018 report conducted by Andrea Schleicher on “Valuing our teachers and raising their status: How communities can help”, found that the quality of learning that teachers provide was critical. Teachers were stressed and facing burnouts. Meanwhile, TALIS reported that less than 1/3 of teachers believed that their profession was valuable to the society. This is opposite to the belief in countries with quality education. There, people value the teachers tremendously. The keys are not only about making the teacher happy and feel positive towards their profession but also about encouraging them to realize their high potential. This helps them keep improving themselves and their practices. Consequently, children will be inspired, and their learning skills will be improved. In 2018, the theme of EDUCA is the Value of Teachers. In this challenging world of digital technology, we aim to help the society realize the importance of the value of teachers and to emphasize the crucial role of teacher in preparing Thai children to move towards a sustainable future. 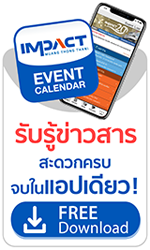 CEBIT ASEAN Thailand - ASEAN’s business platform & festival for innovation & digitization. The event will attract 8,000 technology professionals and business leaders from diverse industries with the exhibition focusing on Communications Technology, Network Infrastructure and Security, Data and Cloud, Business Solutions, Peripherals and Accessories, IOT and Smart Technology, and Emerging Technology. Hosted by the Ministry of Digital Economy and Society, CEBIT offers exciting possibilities for businesses keen to be at the forefront of innovation and technology. Sport equipment discount over 30-80% ex. Sport ware etc. Cournot & Nash Co., Ltd.
October 19, 2018 Show Time: 20:00 hrs. October 20, 2018 Show Time: 18:00 hrs. Four One One Entertainment Co., Ltd.